This is the front cover of an undated (possibly 1920s or early 1930s) edition of "The Nürnberg Stove" published by A. Flanagan Company of Chicago. The author is listed on the title page as Louise De La Ramé. That would be Maria Louise Ramé (1839-1908), an English novelist who wrote under the pen name Ouida (though apparently not in this instance). She preferred to be known as Marie Louise de la Ramée, and her pen name came from "her own childish pronunciation" of Louise, according to Wikipedia. She wrote dozens of novels, children's books and short stories during her career. Her most famous books were probably "Under Two Flags," which was adapted to film five times between 1912 and 1936, and "A Dog of Flanders," which was filmed most recently in 1999, with Jack Warden and Jon Voight. "Her friends have erected this fountain in the place of her birth. Here may God's creatures whom she loved assuage her tender soul as they drink." 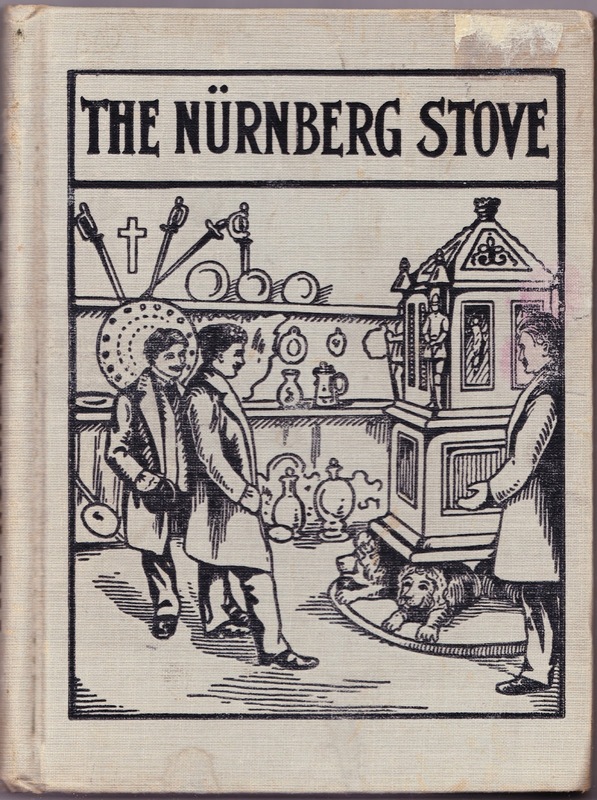 Circling back to "The Nürnberg Stove," the short novel is about August Strehla, a Tyrolean boy, who is devastated when his father sells the family's magnificent heirloom stove — created by Augustin Hirschvogel in 1532 in Nürnberg — in order to pay debts. So he stows away inside the stove on the journey to its new owner. August lived in a little town called Hall. Hall is a favorite name for several towns in Austria and in Germany: but this one especial little Hall, in the Upper Innthal, is one of the most charming Old World places that I know, and August for his part did not know any other. It has the green meadows and the green mountains all about it, and the gray-green glacier-fed water rushes by it. It has paved streets and enchanting little shops that have all latticed panes and iron gratings to them; it has a very grand old Gothic church, that has the noblest blendings of light and shadow, and marble tombs of dead knights, and a look of infinite strength and repose as a church should have. Then there is the Tower1, black and white, rising out of greenery and looking down on a long wooden bridge and the broad rapid river; and there is an old schloss which has been made into a guard-house, with battlements and frescos and heraldic devices in gold and colors, and a man-at-arms carved in stone standing life-size in his niche and bearing his date 1530. A little farther on, but close at hand, is a cloister with beautiful marble columns and tombs, and a colossal wood-carved Calvary, and beside that a small and very rich chapel: indeed, so full is the little town of the undisturbed past, that to walk in it is like opening a missal of the Middle Ages, all emblazoned and illuminated with saints and warriors, and it is so clean, and so still, and so noble, by reason of its monuments and its historic color, that I marvel much no one has ever cared to sing its praises. The old pious heroic life of an age at once more restful and more brave than ours still leaves its spirit there, and then there is the girdle of the mountains all around, and that alone means strength, peace, majesty. In this little town a few years ago August Strehla lived with his people in the stone-paved irregular square where the grand church stands. Hooked? If you are, Project Gutenberg offers the entire novel for free. 1. It's not clear to me whether Hall is an actual town or a figment of Ouida's imagination. In my edition, the illustration opposite the first page of the novel is labeled "Montze Tower," which doesn't come up in any online searches.